As your family grows larger, it may become more difficult to finance the annual vacation. The cost of plane tickets, meals, and accommodations can put a strain on even the largest of budgets. We at Tahoe Signature Properties can feel your pain and are proud to offer a solution with our 3-bedroom North Lake Tahoe vacation home rentals. Reasonably priced and capable of sleeping up to 12 people, our homes are located in the heart of Tahoe. Featuring hot tubs, fireplaces, million-dollar views, and fully equipped kitchens that allow you to cut down on vacation costs even more by providing you with a happy place to create home-cooked meals, our 3-bedroom North Lake Tahoe vacation homes may end up being the highlight of your vacation! 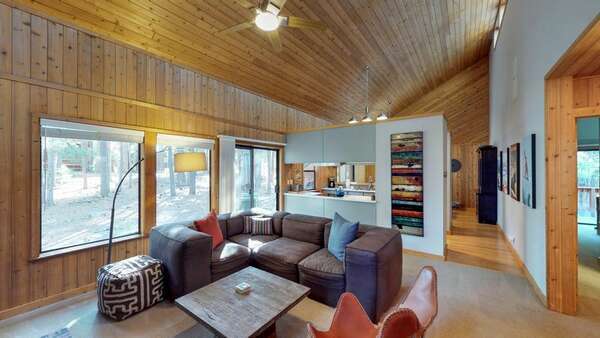 As the door swings open to reveal your 3-bedroom vacation escape, you begin to realize that these North Lake Tahoe vacation home rentals are what you’ve always dreamed of. Rustic cabins with vaulted and wood paneled ceilings, stone fireplaces, and soft carpeted floors immediately begin to feel like home. Charming Craftsman-style bungalows with spacious kitchens allow more than one chef in the kitchen, while large and airy living areas invite the entire family to play games, read books, or watch a movie on the large flat screen television. Spectacular lake cottages hold dining areas containing sturdy wood furniture which are the perfect spot to enjoy a meal, while the bedrooms offer a place to quietly retreat from the noise and chatter that comes along with a large family, no matter where you are. Bathrooms with jacuzzi tubs, private patios with gas grills, and views of spectacular Lake Tahoe that make you never want to leave are just a few of the amenities you can expect in a Tahoe Signature Properties 3-bedroom North Lake Tahoe vacation home rentals! Tahoe is an outdoors kind of town, with seasonal adventures awaiting around every bend. Summer in Tahoe is a fisherman’s paradise, with the lake offering up a carried selection of trout, bass, and salmon all waiting to be caught and served up for the night’s dinner. Winter brings snowmobiles, skiing, snowboarding, and the wonderful feeling of crisp mountain air as you fly down hills and speed across trails with total abandon. And finally, hiking through the Humboldt-Toiyabe National Forest is a thrill any time of year, as long as you dress for the weather! Where can you find a bunch of gold nuggets, a collection of rare Native American artifacts, and the one and only “Auburn Centennial” by Thomas Kinkade all under one roof? You guessed right: It’s all right there inside the walls of Placer County Museum. Besides these veritable treasures, the museum also preserves the history of Placer County from the very first inhabitants called Nisenan all the way to the mid-20th century. The museum is located at the historic Auburn building where it occupies the whole of the first floor. And if you enjoy historic tours, you can join the tour organized by the museum every Saturday morning at 10AM that takes you through Old Town Auburn. It’s a free guided tour and not far from our North Lake Tahoe vacation home rentals. Taking to the air has always been one of man’s dreams. Icarus plastered feathers all over his body with wax and jumped over a cliff. Well, you don’t have to do that just to get the soaring sensation; you can try flow arts instead. Basically, you’ll defy gravity but without the inevitable risk of meeting Icarus’s fate. Tahoe Treetop Adventure Park lets you float over the treetops and experience the ancient dream of flying while being tethered securely by ropes. In addition, North Lake Tahoe has many centers that offer you the opportunity to experience flow arts in a safe, yet exciting way. Tahoe Flow Arts Studio, for example, is a community flow space that is based on cooperation rather than competition. Dancing is combined with yoga to create a form of art that is totally unique and liberating. If you’ve always admired those noble animals and wished you could get a chance to ride a horse and gallop into the sunset, this is your chance. You’ll be doing a lot of riding, but no galloping. Let a gentle beast carry you at a leisurely pace through the beautiful landscape. The lake shore looks a lot different when you view it from the back of a horse. Alpine Meadows Stable offers one-hour, two-hours, and half-day tours with a knowledgeable guide who will take you across the reservation. Zephyr Cove Stables has more than just tours on offer. Enjoy the scenic trails of the High Sierra wilderness. Their tours are available for the whole family, including children from the age of seven and older. Your Tahoe Vacation Starts Now! Contact us to reserve one of our 3-bedroom north Lake Tahoe vacation homes today and discover why Tahoe is one of the most popular vacation destinations in the US!